Danny: Hello. This is Danny Ryan and welcome to the Two Bald Brothers and a Microphone Podcast. I’m here with Tommy Ryan. How are you doing Tommy? Tommy: I’m doing great Danny. Looking forward to today. Talking about SharePoint intranet-in-a-box. Danny: Awesome. Yes, yes and interview number two. Today we have Sam Marshall from ClearBox from over in the UK. How are you doing Sam? Sam: Hi there. I’m very well thank you. I’m looking forward to it, too. Danny: Awesome, awesome. Today we’ve got a great conversation that a lot of people are talking about. I know it’s come up for us quite a bit. I wanted to talk about … with Sam, he’s got a company that really focuses in on the decision process around what you should be using for your digital workplace. Sam, you’re gonna correct me if I say anything wrong here, right? Sam: Oh for sure. Yeah. Danny: Good. So Sam has a lot of options as far as workshops that he runs. Also, at the end of the podcast, we’ll go through a report that he has available for people who are interested in the products that are out there. I’ve given sort of a high level for you there Sam, but just tell me a little bit more about what your company does. Sam: Yeah, thank you Danny. We’re based in the UK. This year’s our 10 year anniversary. We focus on digital workplace, strategy, things like intranet adoption, intranet governance, getting the right team in place. Basically, we do everything about intranet apart from the actual technology. So, we don’t sell any products, we don’t build things on top of share points, we’re really focused on the needs of the business user and the analogy I make is … it’s a bit like once a company’s installed a load of gym equipment, you then need to say, “Well okay, what’s the training program for our team? What is it we’re going to do with this equipment to achieve our goals?” and that’s quite a nuanced thing to help people think through because you carry on with the analogy, if you’ve got a bunch of marathon runners, they’re going to use the gym equipment in a certain way and do certain routines, but if you got a bunch of Olympic power lifters, then they’re probably completely different equipment and follow an entire different program. We come across this a lot with Office 365, but you get so much stuff just with that license. The trick that we try and help companies think through is, what do we need out of this goodie bag that would work for us and what can we safely ignore? Danny: Yeah. What’s your background … I was just inter … just going to ask you probably what you were just going to say, but tell me more about your background? Sam: You’re going to cue me up perfectly, and I interrupted you by segueing in to it myself. I’ll give you the funny answer. I studied baboon behavior as a psychology graduate, and then I specialized in Artificial Intelligence, building like a robot. If that isn’t the perfect background for intranet, I don’t know what is. It turns out that the baboons are like robot’s pays as well, as getting involved in things like SharePoints. A man’s got to eat, you know. In between that, the serious answer is I did a lot around knowledge management and working with internal communicators. That’s what got me into intranet and things like SharePoint cause I think the technology to me isn’t that interesting, but the things that people do with it and how it affects the digital workplace, that’s fascinating. Tommy: In saying that, if you honed in on SharePoint and Office 365 as that platform, or are there other platforms outside of that? I know you advise people on Intranets and the box that interacts with SharePoint, but are there other platforms that you get involved with? Sam: Yes. We’ve always made a point of saying “We are technology neutral,” because we don’t see that as the biggest challenge. We have worked with clients who are using open source systems like, Drupal, and also some of the ready-made non-SharePoint platforms like, Interact, which is a big player in the UK and I think also getting more visibility in the US. But, in fact it’s probably 80% of our clients have already made the decision that the answer is Office 365 and they come to us saying, “Now Sam, can you tell us what the question should have been so that we can justify the answer, Office 365.” We run with that. We have no problem with the technology choices that we make. Danny: Awesome. What … just sort of getting into our conversation here, which is … and it has to do with really the build versus buy decision, what’s been happening over the last couple of years with regards to, in particular with SharePoint online, but also some of the other products that have been coming around. What and … How did you get into this whole idea of doing this, the SharePoint in a box report? Give me a little bit more background, was it just a lot of people were asking you for what the options were out there? Tell me a little bit more about that. Sam: Yeah, yeah, in part. So maybe we should explain a little bit what this intranet in a box is and what report is that we’ve done. 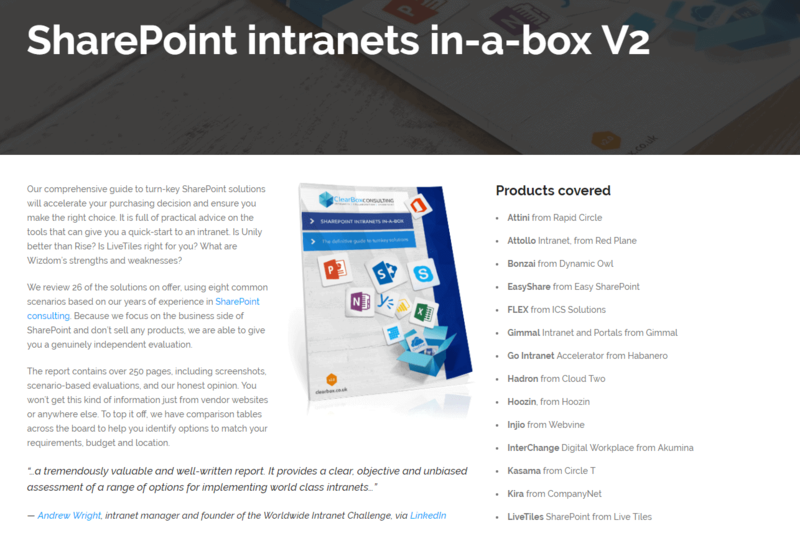 So intranet in a box products are things that you install on top of SharePoint, or alongside SharePoint, or within your Office 365 environment, and they kind of take the bare bones of SharePoint and give you a lot more of what you would normally expect to see in an Intranet. So, for example, that hero image, the news publishing, maybe a much nicer looking feel. So recently, something that worked well on mobile, that wasn’t available from SharePoint 2013. We saw a big growth in companies who have maybe been doing this for years as an agency, taking a whole bunch of requirements, and responding to an RFQ, and then building it again and again for different clients. And I suppose each one of these companies said, “Do you know what? Why are we building yet another Carousel web-part from scratch when 90% of the requests ask for the same thing. Why don’t we turn that into some kind of product so people can buy it and take an accelerated approach to getting the intranet that they want. And as ClearBox, we noticed this was happening, and thought well, we’re in a pretty good position to be the neutral guide for people on this because we’re never gonna sell any of these products, but we do have a really good understanding of what it is that companies are looking for. We’ve worked with everything from small charities of a couple hundred employees, all the way up to the Unilevers of this world that have 50 or even 100,000 employees, so we see the range of requirements. So we produced a paid-for research report, it’s like 250 pages. Every product, we put them through like eight different common scenarios, so things like publishing news, supporting communities, two-way conversations, analytics, and we evaluated them consistently across each one of these and said to the vendors, “Show us how your product would fulfill this scenario.” So it was a little bit like a mock RFP, where you might come up with some use cases and ask for a demo of those use cases. Since we did that, we find yet more indignant vendors knocking on the door, who yet again felt excluded by this, but also some really good feedback from the vendors who had taken part, saying “Yeah, we’ve got lots of new things to show, we’d like you to do an update of the report.” So we’re just oiling the wheels to start again for this year and, so far, we’ve had, I think, 48 companies that want to be listed. Sam: So this is a very, very active market area. And I think really interesting because what’s driving it from a company point of view, a lot of our clients say we’ve got this steer from CIO, we want to buy, not build everything in IT. Wherever we can, we want software as a service, or we want it to be cloud based, because we’ve been so often in the past with SharePoint, where we invested hundreds, if not millions of dollars in this custom solution. Microsoft broke it all and it cost us hundreds, if not millions, of dollars more to fix it. Can we push that headache onto an external company who will not just keep in-step with Microsoft plans for us, but in-step with maybe a whole cohort of customers, and therefore spread the cost. I think not only is there a boom from the supply side, but there’s also a real boom from the customer interest happening as well. Danny: Looking at that report Sam, it’s incredible. So detailed and it’s something that I think a lot of people like to see and kind of compare it as rating it as a Consumer Reports-type of view, where you’re comparing some of the same parameters. Sam: Thank you, a lot of ibuprofen went into that report, I can tell you. Danny: Yeah. You can tell there’s someone that has attention to detail or obsessive-compulsive maybe behavior there. Sam: It wasn’t just me, I had a team of eight obsessive-compulsive working for me as well. Danny: Okay, nice. Yeah. And I can see … it’s interesting to see the amount of folks that are in this space. You probably don’t know this, but you wonder what’s the market opportunity, you know, what does the space look like, and all these companies that are going into creating an intranet in a box, how are they rationalizing that. Are they product companies that go into it saying “We see this space, it’s got a market potential of this, and we’re going to go after that market and go after this niche in that market,” or is it consulting companies that built the same customizations over and over again and that productize that and try to spin off a product side. I assume you see a mix of those and do you have any comments on what makes a good intranet in a box company that can be successful endeavoring in this space? Sam: It’s a really good question because it has a lot of signs of an immature market, and what I mean by that, is last year on the whole, pretty much everyone doing this is coming at it from the consulting side and moving into being a product company. Sam: I don’t see many product companies who are saying “We want our product in this space, alongside all the other products that we’ve got.” And what that means is that there’s a really challenge for a consulting mindset company to change the way they work to support a product that might mean multiple releases and help desks and all the other things that you would expect when you buy a license that don’t fit that project mindset of doing consulting where there’s a clear endpoint, and anything you want after that is another contract or a kind of bespoke support engagement. Sam: So to answer your question about what makes it good, in a box vendor, it’s the ones who’ve really, I think, segregated their business so they have a team that’s dedicated to look after the product and just thinking about the product roadmap, irrespective of there necessarily being a sale behind every feature that they add. So it’s not like they’re saying “Oh we’re going to do this because a big client has asked for it,” they’re doing it cause it’s the right thing to do and they’ve got that vision of where they want to set the product, as a way to generate the sales. Tommy: What you see is a sampling of companies that haven’t made that segregation, is that maybe the guy that developed a feature that you’ve raised a ticket on cause it’s not working right, is pulled off from a client project for the next three months, and that poor guy’s going to have a real tension in terms of how does he allocate his time to looking after the conflicting needs. Sam: If I can share a little secret on the podcast, and everybody listening has got to promise not to repeat it. I’m joking. There are a few companies that got in touch saying “Please can we be in your report,” and they couldn’t even provide a website link cause they hadn’t got the website live, you know, the product was that fresh. We’ve had a little chat with them, said “Come back next year when there’s more to show,” because I think part of what people investigating this area need to be aware of, is some of these products, I don’t think, will last, and that’s part of what we’re trying to help do, is understand how robust is this offering. Cause if you back a product where the vendor walks away from the market in 18 months, then you’re no better off than if you built it in house, you got that same headache, in terms of upgrade groups. Danny: Yeah, that’s an interesting thing, and as I was looking through the report, I see when the company was founded, it’s so and so IT consultancy. Is there any measures around, say, maturity and, let’s say, process product capabilities that can give a client a certain sense of assurance that they’re going to be around two years from now versus they’re just kind of dipping their toe in the water. How do companies sort that out and do you help them with that? Sam: We do and there’s a couple of checkpoints within that. So one is how committed is this company to the product roots, and the other one is how stable is the company itself. So, you know, the company might live on, but they might say “Yeah, we’re walking away from looking at this product anymore,” and you’re still high and dry. Sam: In terms of the company stability, I always say to clients, just make sure your procurement is doing it’s due diligence in terms of looking at the vendor financials, the Number of employees they’ve got, and the track record of companies of a similar scale to yourself. The usual revenue credit check-type stuff you do. Sam: In terms of the product maturity, in the report we list when the first release of the product was, we list how often they release it. In the new version, we’ve asked what’s the typical customer size, and also what’s your largest customer size, and most of them have also given us the names of reference companies. And all of those are good reflections of a healthy product, I think. Danny: Mm-hmm (affirmative), mm-hmm (affirmative). That’s good. It’s interesting your answer to the profile of a company that it’s, you know, primarily consultancies, you wonder is there the market there for it where product companies maybe do a market-level research versus saying “Oh we’ve got code for this,” it’s more of is there a market established that we know we can invest so many dollars in product to convert so much business. Do you think … do you have a sense of why traditional product companies are not entering this market? Sam: Well, it’s a busy market, isn’t it. Danny: Yeah, yeah, maybe they see it’s too packed. Sam: Not necessarily, the SharePoint space has traditionally been dominated by the partner model, and there aren’t so many companies that have got established SharePoint products who, perhaps, understand the intranet world, you know, that whole publishing model. They’re much more on things like the transactional BI or the back [inaudible 00:17:31] tools. Sam: You know, you think about metalogix or K2 on Intact, I don’t think any of those have anything else that’s similar to what an intranet would do. I mean what are your guys’ thoughts on this cause you’ve, I know, have been exploring this space as well. Danny: I can maybe say a little bit about that Tommy and I are very interested to learn sort of about … and this is probably because we’ve been in business for quite a while and have tried launching a couple products of our own, we’re not planning on launching nay intranets in a box or anything along that/ those lines. I think one of the things that Tommy and I have recognized that it is truly a different type of business, and in order to be successful, we’re at the point where we say it’s got to be a separate company doing a product, it can’t be us. So we’ve recognized that and so we’ve been very cautious about entering into any sort of product type of business. In fact, I’ve got up on our website, we’ve recently … we did some integration products with Salesforce, and we’ve recently retired those because it’s just … we just don’t … we can’t … it’s not the right business for us. What I’m interested … if I can … I’m interested right now because of traditionally the … number one the SIs, how would they handle … cause typically with these different intranet and box products, they’re selling both the product and the services along with it, what are … cause we’re an SI that doesn’t have this, are they typically just building? Are you seeing them build on top of SharePoint or are they … and we’ve partnered with … there’s been some companies that we’ve worked with that, in particular, where they’re moving from Jive, which is a social platform, to Office 365, we have some expertise where we’ve been pulled in to do the migration where we’ve got some expertise in several of these products. But how are SIs … what are they … are they deciding I’m just gonna build on or how are they handling this whole situation? Sam: I see a big growth in the more established in a box products, setting up partner and resell and networks. So I’m guessing these guys are aligning themselves to specialize in one or two in a box products and saying “Yeah, we can meet 80% of a client’s requirements by adopting this product,” and then we’ll fulfill the other 20% as bespoke. But it allows them to deliver a solution way quicker than they could have done before. So some of the in a box vendors, in particular Powell 365 and Kamina, are really geared up to deliver through SIs, rather than you would go directly to them for the solution. Sam: And again, I see that as an encouraging sign of maturity, that the product is something they can build out a partner network through. The less mature ones, you could argue it’s not really a product because it’s actually a set of code libraries and you always need the in-house consults and the expertise to turn it into a delivered intranet solution. Danny: Yup. Tommy, were you gonna say something? I think I cut you off a little earlier, I’m sorry. Tommy: I want to say Sam was asking what do we see as that marketplace and why are there intranet in the box solutions out there. We started in the SharePoint space back in 2006/2007, and it’s when Microsoft really touted SharePoint as a platform, a customizable platform, and gave a lot of knobs to turn as developers, and as SharePoint is maturing, and as Microsoft is going to the cloud, you can see SharePoint becoming more commoditized and going into the cloud, being in a multi-tenant environment, it’s really not suited well for some of the customizations you would do in the past. So you have organizations that want those better look than feels and they can’t work within the constraints of what Office 365 puts in place, so they want to extend that capability and have more control, and that’s working with these companies that are providing more the functionality that might not ever get there in Office 365 or maybe doesn’t get there soon enough, where they’d rather get there sooner by buying it than building it, knowing that things might change underneath them with Office 365. And I think also, it’s been the space around Microsoft where Microsoft kinda put out share point and said “It’s here, it’s got some core capabilities, do with it what you want and think about the possibilities of what you can do with the intranet.” That can be paralyzing to a lot of organizations, and buying something out of the box, like what we experienced with people buying Jive, is it’s a polished product versus a platform play, and a lot of organizations kind of like that and went in that direction. I think these intranet in a box companies are seeing that people want the reliability of having SharePoint storing the data, being that backend, and then have the nice shiny upfront with something that Microsoft is not necessarily known for, but getting better at. You’re seeing things that are coming out that make you about Microsoft. It’s becoming “more modern” in their UIs, but with a company that size, they’re always going to be probably a step or step and a half behind what these smaller companies are able to do with web technologies. Tommy: And that’s just my kind of high-level view of, you know, why is this space being created, and it’s not totally surprising that it’s coming primarily from SIs doing this. But it is, I think, a sign of, like you said Sam, maturity, the market, where it is coming from, shared code libraries, that are coming from projects, from SIs versus you have a product company saying “There’s an addressable market, there’s a gap here, we want to address it and we feel confident that people are going to spend the money here.” We’re surprised … it might because we’re doing a lot of Jive to Sharepoint point migrations, but we’re surprised in the number of companies that are choosing the intranet in a box option, because it will put your data inside other CMS systems. We’ve seen with some of these systems, they’re not just storing everything in SharePoint, they have to have their own CMS to give the kind of capabilities that they add on top of SharePoint, then maybe they just store the file in SharePoint but the blogs are sitting in their own CMS system inside of SharePoint. Sam: I mean I absolutely agree with your analysis, Tommy, but that point about where your data sits … there’s only three or four where it resides in a separate CMS. So we’re working with a client at the moment where it’s an absolute prerequisite that the data stays entirely within the Office 365 tenant. Sam: There’s about 20 options where that’s definitely the case, they … some of them it’s really just web parts and styling that they’re adding, they’re not taking the data outside of your own client at all. Tommy: Yeah. That’s what I would want as a customer, but also some of the sexier ones are not necessarily using SharePoint as a store cause it complicates things. A blog in SharePoint, that data structure’s totally different than what you would want to do from scratch to create a blog interface. Sam: Yeah. It’s understandable cause often the brief from the client is can you make SharePoint look not like SharePoint? Sam: The big trade off is that it becomes an uncomfortable hop back into anything Office 365. So if you look at something like flow and say “Ah it’s great, can’t we use flow as part of what we’re doing with this separate CMS?” The answer’s always gonna be no because the CMS won’t have that level of integration. Tommy: Mm-hmm (affirmative). Mm-hmm (affirmative). Danny: So I would be remiss if we didn’t talk about … sort of the hot topic and the elephant in the room, which is communication sites. Sam, I was fortunate enough to listen in on a webinar, and I think this is an interesting thing cause as a feature … sort of as maybe a feature set, this is one of the things that SharePoint and box companies were addressing, which was the modern experience working well on mobile devices, and we’ve seen this year, Microsoft release this. What … give me … what does that mean to folks, how does that … what’s your general take on what’s happening right now, in particular with communication sites? Sam: Yeah, so communication site’s really interesting, really good to see because, I think, it reflects that Microsoft is definitely getting the UX message that it’s so important, and they frankly just haven’t got it right for many years. Communication sites are fantastic when you need to create something that’s attractive, around a single topic. But it is still a micro-site, in effect. So, right now, we shouldn’t pre-judge cause we know this is just like the first release, and there’s probably lot more to come from Microsoft. Right now, it looks like an intranet homepage, but it really isn’t. And what I mean by that is that it has the hero images, but they’re just images with links behind them, it’s not actually you click on it and you’re taken into a news article unless you manually tie that hero image into a news article. There’s no cross-site publishing, so we find once you get up to 500 employees, or two or three countries, or two or three business sectors that your company operates in, it’s not enough to have separate sites for everything. You want to be able to create a news story and say “Here’s a news story, now zing it out so we can target it to everybody in Canada, but not in the U.S., or everybody who worked in sales, but not in marketing.” And for that, you still need the idea of a news center, a repository of news, and some kind of metadata and personalization, which then does a search, call and pulls them back to show people. That’s not something that I can see coming in comp sites anytime soon. In terms of the in a box marketplace though, Microsoft is definitely gonna make the sales guys work harder cause comp sites look great. Getting from ResX saying “We really need an intranet in a box,” when they can see a comp site becomes harder, it probably means that some of the in a box vendors who were targeting companies of 50 to 200 employees, somewhere like the small to medium enterprise business, they might pull out of this market in time, unless they are really focusing on doing non-communication stuff like transactions, which some of them do very well, indeed. Sam: Yeah. I mean what your take? Do you see your clients excited by communication sites? Danny: From my experience, Sam, I think it’s early on and they’re so buried in everything else that they haven’t fully explored that at this point. Danny: Yeah. Definitely. It’s something that makes you pause to say “Okay how does that play into the equation?” The thing that I think Microsoft’s doing well with, but developers in the Microsoft ecosystem might get frustrated, is they’re trying to narrow down the lane a bit, and get more focused around areas in SharePoint to be very good at. I like the concept of segregating into teams and communication sites, and that I think is the 80/20 versus the traditional Microsoft is we’ll try to cover 100% of the space versus honing in and doing very well on the majority. They can go across platforms and devices to expose that in a polished way. I just love seeing teams and that visual overlay on top of a SharePoint team site or Office 365 group. That’s exciting for us to really have a customer go a long way because they’ve gone deep on that topic of a team site versus before, in 2007 and 13, you had 20/ 30 different things to choose from as a starting template. I think that’s different for Microsoft, I think it is speaking to we’re all busy people and we need less choices. It’s interesting that you say there’s 50 intranet in a box selections. I think that’s good news for your company because that just makes that equation even more complicated of okay, am I picking the right one? I don’t have time to evaluate 50 different options. Then you feel at the mercy of which one has the best marketing program to touch me, is the one I’m gonna choose, and maybe that’s not the right selection criteria. I need to make sure I’m thorough and picking the company that best aligns with our needs and our direction. Sam: Yeah. That is so important because once you’ve made that choice, once you’ve committed to it, you really have narrowed down the scope of what you can do. So these in a box products, they make things easier to use by, in effect, reducing some of the choices that you would have if you were On a bare bones SharePoint and could develop anything. I always say to people, “Don’t pick a product and think that you can just tweak this and tweak that,” because you won’t be able to if you want to stay faithful to the vendor’s own roadmap. Sam: If they become tomorrow a formal requirements gathering exercise, and we’re helping quite a few clients through this at the moment, just to go through an RSP that gets you in the right place to come up with a short list and then choose between them. Tommy: Sam, I think we could talk to you for hours here, so I know you’ve got a hard stop. So before we wrap-up, if you don’t mind, I know you mentioned that you might have a discount code for listeners, can you give us a little bit more … some more details on that? Sam: Yeah, sure. So if you head over to our website, which is clearbox.co.uk, I know I’ve got a funny accent, so let me spell that out, that’s c-l-e-a-r-b-o-x, opposite of black box, .co.uk. You will see, right there on our own hero image, a link to the SharePoint intranet in a box reports, and when you go to check out, use the code t-w-o-b-b 20, so that’s t-w-o-b-b, for bald brothers, and 20, cause. T-w-o-b-b 20, and you get 20% off, so the full price is $495 dollars, you’ll get $99 off, making it $398. Sam: [crosstalk] Right until the end of August so if you’d like, on your summer holiday reading by the pool, the report will certainly help with your siestas. I mean it will certainly give you plenty to read. Danny: That’s wonderful. And maybe, Sam, we can have you back after the next version is out. Tommy and I’d be interested to hear some of the details on that, so that’d be wonderful to have you back. Sam: I’d love to. Once I’ve had a big lie down, I’d love to come back and talk to you more about this topic since you’re really into it. Danny: Super. Well thank you, Sam, thank you Tommy, and thank you, everybody, for listening. Yeah, thanks so much. Sam: Pleasure, thanks very much, guys, for inviting me on. It’s been great. Tommy: Absolutely, take care now. Remember to use discount code “twobb10” for 10% off!